What is Xuanfu Herbal Steaming? Xuanfu Herbal Steaming Therapy is based on the ancient method of Chinese medicine to relieve pain, stress and help overcome injury. At TCM Shanghai we use this ancient method with the new high-tech steaming equipment. Herbal steaming uses high temperatures, negative ions and infrared rays, to clear the meridians and promote the blood circulation. What are the results of herbal steaming? You shall feel more relaxed and the steam therapy can optimize the effects of follow-up treatments. Patient usually has better sleep quality after the treatment. If you would like to see how Herbal Steaming can help you relieve pain or stress please contact us below or call us +971 4 886 2862 and make an appointment. At TCM Shanghai, the patient goes through a TCM Health Screening and a doctor’s consultation prior to the treatment. Based on the findings, the practitioner determines how to proceed with the treatment. 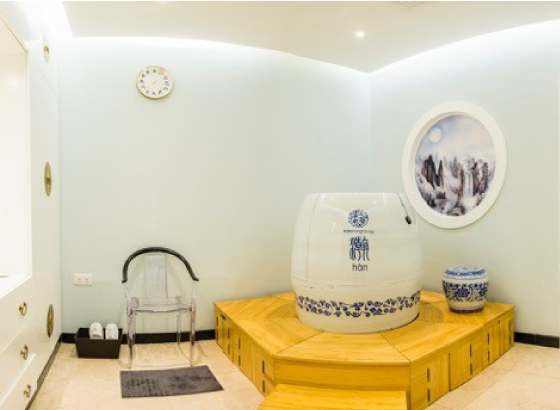 During the therapy session, the patient sits in a specially designed egg-shaped steam bath cabinet. The herbal steaming egg completely encases the body below the neck which allows the patient to breath the fresh air. As a herbal remedy, we add different types of customized herbs and steam the mix into the bath. The temperature is between 35– 40° Celsius which is the optimal temperature for the body to get the most benefit. Depending on the nature of the health condition, a steam bath takes between 15 – 25 minutes and can be repeated as required. The inner wall of the urn is densely covered with more than 2,000 volcano tourmaline coin-shaped pieces. 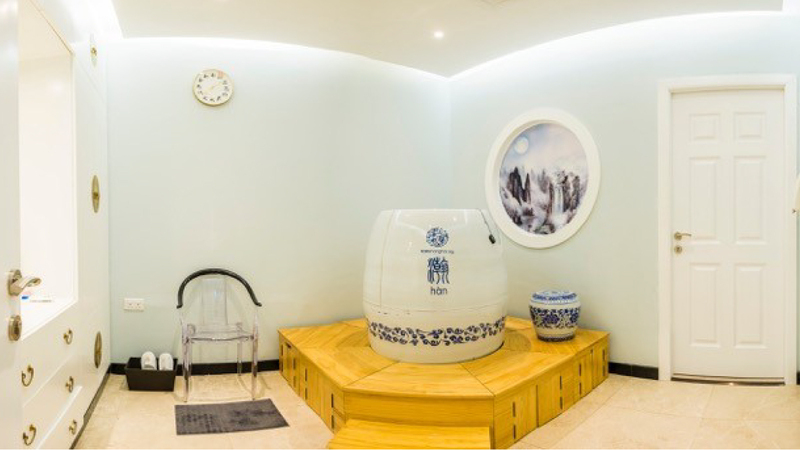 In order to maintain the hot steam effect, the temperature inside the urn is kept consistently between 35 to 40 ℃ with limited monitoring allowing you to completely relax.